Famous Ray's Pizza on Sixth Avenue, which closed in October, will be taken over by rival Famous Original Ray's Pizza. 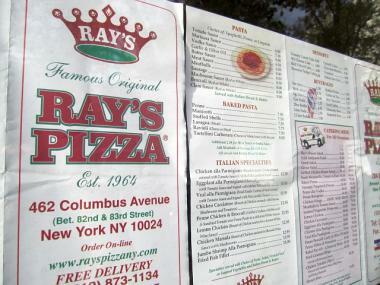 GREENWICH VILLAGE — Would a Ray's by any other name smell as sweet? The Ray's Pizza that sued Famous Ray's Pizza on Sixth Avenue and West 11th Street earlier this year for copyright infringement says it will soon take over its rival's former restaurant. Famous Original Ray's Pizza, which has eight locations citywide, will move into the the 465 Sixth Ave. space, the former home to Famous Ray's Pizza, according to Famous Original Ray's Facebook page. 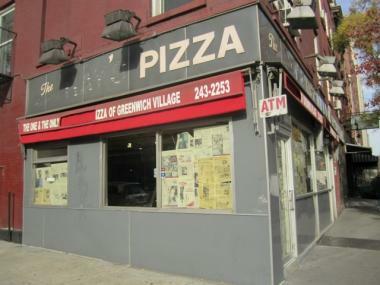 "Grand Opening Of Famous Original Ray's Pizza @ 11 street / 6 Ave. COMING SOON," the page says, Jeremiah's Vanishing New York first reported. Menus from Famous Original Ray's were on display in the newspaper-covered windows of the eatery, which closed in October, when DNAinfo visited Friday afternoon. Menus from Famous Original Ray's were on display in the newspaper-covered windows of the eatery, when DNAinfo stopped by on Dec. 2, 2011. A Department of Buildings permit to replace plumbing fixtures and repair the kitchen is active. In the last chapter of the pizza wars, USA Famous Original Ray's Licensing Corp. sued Max Brothers Pizza, which owned Famous Ray's, for more than $1 million. The plaintiff — which owns trademarks for the names Ray's Pizza, Famous Ray's Pizza and Famous Original Ray's Pizza — charged the pizza shop with exploiting the Ray's name and eating away at the real Ray's "goodwill, customer base [and] market share," according to court documents. In documents dated Nov. 9, Max Brothers agreed not to use the Ray's name or "any other confusingly similar marks or names on any of [its] … signage, advertising, menus, packaging, websites or domain names." Neither pizza purveyor returned requests for comment, and information on whether Max Brothers had to cough up any dough was not immediately available. The "real" Ray's Pizza that spawned dozens of imitators across the city after opening in 1959 was forced to close in late October due to a legal dispute with the building's landlord. After the 27 Prince St. slice-slinger closed, DNAinfo took to the streets to ask New Yorkers for their suggestions on Manhattan's best places to grab a slice.